5 pm Update: At 5 pm, Tropical Storm Hanna was centered near Cambridge, Maryland on the Delmarva peninsula. Hanna continues to race off to the northeast at 28 mph. Rain has mostly ended in the Washington, DC metro area, but heavy rain continues from extreme northeastern Maryland through eastern Pennsylvania, New Jersey, southern New York and into New England. Reconnaissance has shown that Hurricane Ike is back to extremely dangerous Category 4 with maximum winds of 135 mph. Ike is continuing to move toward the west southwest at 15 mph. A Hurricane Warning is in effect for portions of the Bahamas, the Turks and Caicos, and eastern Cuba. Although Ike could still threaten southern Florida, it's looking increasingly likely that the storm will move on past Cuba into the southeastern Gulf of Mexico. 2 pm Update: The center of Tropical Storm Hanna has now moved to near Williamsburg, Virginia, approaching the lower Chesapeake Bay. Maximum winds are still 50 mph, and the storm is moving northeast at 25 mph. Little change in strength is expected today, but Hanna will be losing tropical characteristics by Sunday. Based on aircraft reconnaissance reports, Hurricane Ike has regained Category 3 strength with winds of 115 mph. Ike continues on a west southwest track at 15 mph, heading toward the Turks and Caicos and the southeastern Bahamas. Ike is a fairly compact storm, with hurricane force winds extending outward up to 45 miles and tropical storm force winds up to 125 miles. After making landfall near the North Carolina/South Carolina border around 3:20 am, Tropical Storm Hanna is rapidly moving up the U.S. East Coast. At 11 am, the center of Hanna was near Emporia in southern Virginia. The storm is moving north northeast at an accelerating rate of 24 mph. This track will take the storm to the vicinity of southern New England by tonight and the Canadian Maritimes by Sunday night. Maximum winds are down to 50 mph, but tropical storm winds extend as far as 200 miles from the center, with the strongest winds in the eastern portion of the storm. A Tropical Storm Warning extends along the Mid Atlantic coast to southern New England. Warnings and watches, including Flash Flood Warnings, have been issued for the local areas affected. 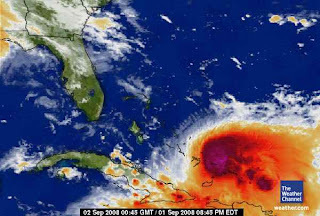 Hurricane Ike has been lowered to a Category 2 storm with maximum winds of 110 mph as it continues moving west southwest toward the Bahamas, with a turn more toward the west expected on Sunday. Ike is then expected to pass near or over the northern coast of Cuba, eventually reaching the Gulf of Mexico. Although fluctuations in strength are likely, Ike is expected to regain major hurricane status in the next couple of days. Tropical Storm Josephine was downgraded to a depression Friday night, and the last advisory was issued for the storm early Saturday. Maximum winds are down to 30 mph, and further slow weakening of the remnants is expected over the next two days. Images (top to bottom): Tropical Storm Hanna radar and satellite views from The Weather Channel, Hanna and Hurricane Ike track forecasts from National Hurricane Center. 11 pm Update:Tropical Storm Hanna is moving rapidly toward landfall on the coast of the Carolinas. The Tropical Storm Warning has been extended northward to Watch Hill, Rhode Island, including New York Harbor and Long Island Sound. Maximum winds are still 70 mph. The center is moving north at 20 mph from a position about 140 miles south southwest of Wilmington, North Carolina. 5 pm Update: Tropical Storm Hanna's circulation has become more symmetric during the day, and the latest aircraft reconnaissance confirms that it is just below hurricane strength. The storm's effects are now reaching the coast of the Carolinas as it moves northward at 20 mph. The center was located about 240 miles south of Wilmington, North Carolina at 5 pm. The Tropical Storm Watch has been extended northward to Merrimack River, Massachusetts, and various other watches and warnings remain in effect from the Southeast through the Mid Atlantic. See the link in the original post below for local watches and warnings. Despite all the focus on Hanna, Hurricane Ike remains a dangerous Category 3 storm. The first reconnaissance of Ike this afternoon has put the maximum winds a little lower, at 115 mph, but restrengthening is likely in the next couple of days. Ike continues on a generally westerly course. There is a large uncertainty in the eventual track, but it's looking increasingly likely that Ike could move on into the Gulf of Mexico after threatening either southern Florida or Cuba. Josephine continues to weaken; it's down to 40 mph. Tropical Storm Hanna has continued to become better organized today, and aircraft reconnaissance has found maximum winds of 70 mph as of 2 pm. On the other hand, the center has been located farther east than earlier reported. The storm is now moving north at 20 mph from a position 310 miles south of Wilmington, North Carolina. Various watches and warnings are in effect for large portions of the Southeast and Mid Atlantic coasts, including the Chesapeake Bay. Local watches and warnings have been issued by National Weather Service offices in the affected areas. If Ike makes a landfall in the U.S. as well, it would set a new record. Scroll down to the previous post for details on major Hurricane Ike and Tropical Storm Josephine. 11 am Update: The Tropical Storm Warning for Hanna has been extended northward and is now in effect from Altahama Sound, Georgia all the way to Sandy Hook, New Jersey, including all of Chesapeake Bay, the tidal Potomac, Washington, DC, and Delaware Bay. Local watches and warnings have been issued by National Weather Service offices in the affected areas. Although Hanna is looking better organized, maximum winds remain at 65 mph. Movement is toward the north at 20 mph from a position 375 miles south southwest of Wilmington, North Carolina. Meanwhile, Ike and Josephine have both weakened slightly. Ike's forecast path has been shifted a little to the south, which could bring it around the southern tip of Florida into the Gulf of Mexico. However, there is still a lot of uncertainty in the track. Tropical Storm Hanna is accelerating toward the Southeast U.S. coast this morning. Maximum winds remain at 65 mph. The center of Hanna's broad circulation was about 425 miles south of Wilmington, NC at 8 am, headed northwest at 18 mph. The track is expected to turn more toward the north today, along with an increase in forward motion. Tropical storm watches and warnings and a hurricane watch are in effect for a large portion of the Southeast and Mid Atlantic coasts from Georgia to New Jersey. Although Hanna could become a minimal hurricane before landfall, that is increasingly unlikely. 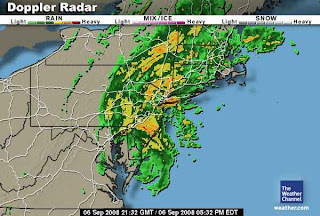 In the Mid Atlantic region, Maryland, DC, and Virginia governments responded to flash flood and tropical storm watches with emergency preparations for the expected heavy rain and wind. This provoked the usual asinine commentary from the anonymously ethereal rabble. 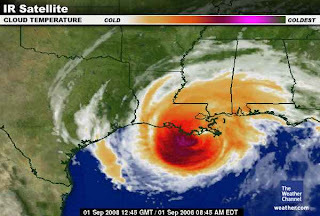 Hurricane Ike continues to be a major storm, although it has dropped a notch overnight to Category 3. Maximum winds are 125 mph. Although some weakening is forecast in the short term, Ike should still be a major hurricane as it approaches the Bahamas and then possibly southern Florida, Haiti, or Cuba. Tropical Storm Josephine remains weak, but maximum winds are up a little to 50 mph. 11 pm Update: Tropical Storm Hanna continues to move northwest toward the Southeast U.S. coast. At 11 pm, it was moving at 14 mph from a position 540 miles south of Wilmington, NC. Maximum winds are still 65 mph, although satellite images show that Hanna is a little better organized than earlier in the day. Another reconnaissance flight will check out the area in a few hours. 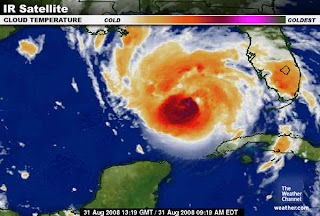 Hurricane Ike is still a major Category 4 storm with maximum winds of 135 mph. It's moving on a due west course at a speed of 14 mph with a turn more toward west southwest expected on Friday. The forecast track continues to take the storm through the Bahamas with a possible landfall in southern Florida by early next week. Tropical Storm Josephine remains weak; maximum winds are 45 mph. Tropical Storm Hanna has been attempting to organize its circulation pattern today while maximum winds remain at the strong tropical storm level, 65 mph. Although Hanna could potentially reach hurricane force before landfall, that is unlikely. A Hurricane Watch has been extended for portions of the Carolinas, however, in recognition that there is very little difference between a strong tropical storm and a minimal hurricane. Tropical storm warnings and watches have also been extended from as far south as the Georgia coast to New Jersey, including the Chesapeake Bay, tidal Potomac, and Washington, DC. Hurricane Ike is still a Category 4 storm, but maximum winds are now a little lower at 135 mph. Ike is expected to fluctuate in intensity, but it should still be a very strong hurricane when it arrives in the vicinity of the Bahamas late in the weekend. After that, Ike could do anything from remaining out to sea to hitting Florida or Cuba, or even moving on into the Gulf of Mexico. Tropical Storm Josephine remains weak with winds of only 45 mph. This morning's tropical trio review finds a weakened Tropical Storm Hanna still capable of threatening the Southeast Coast, an even stronger Hurricane Ike, and a weaker Josephine. Tropical Storm Hanna's satellite appearance this morning is looking extremely disheveled. Very dry air to the north has choked off the convection at the core of the storm. Conditions are expected to be unfavorable for development through today, but strengthening to hurricane force is still possible as the storm moves northwestward at a faster rate toward the Southeast U.S. coast. Tropical storm and hurricane watches are in effect for portions of the Georgia coast through the Carolinas. Dangerous Category 4 Hurricane Ike strengthened even more overnight to as high as 145 mph, but it's down slightly in the latest advisory to 140 mph. It is expected to remain strong as it continues in a westerly direction generally toward the Bahamas. Tropical Storm Josephine continues to weaken a little more as it moves west northwest. Some fluctuation in strength is possible, but the storm is expected to remain weak. Christopher Landsea of the National Hurricane Center was interviewed last night on NPR's All Things Considered on the subject of hurricane track and intensity forecasting. While Hanna has been getting its act together near the Bahamas, Hurricane Ike further out in the Atlantic has been rapidly intensifying. As of 8 pm, Ike was a major Category 3 storm with maximum winds of 115 mph. By 11 pm, it was a Category 4 at 135 mph. Ike has gone from tropical storm to Category 4 in 12 hours. This is now the third major hurricane of the season. Ike's generally westward track should bring it near the Bahamas this weekend. Tropical Storm Hanna's maximum winds are 65 mph as of 11 pm. It is expected to regain hurricane strength in the next couple of days as it approaches the Southeast U.S. coast. Various hurricane and tropical storm warnings are in effect for the Bahamas. After hammering Haiti with more flooding rains, Hanna has caused power outages in the Bahamas. Josephine has weakened again, and it is expected to continue doing so. Its maximum winds are now down to 50 mph. Ike has strengthened to a hurricane with maximum winds of 80 mph. It is forecast to become a major hurricane as it moves generally westward toward the Bahamas. Tropical Storm Hanna remains at 60 mph, but it is forecast to become a hurricane as it moves northwestward near the Bahamas, then more northward toward the Southeast coast. The most likely landfall is in the Carolinas. Rain from Hanna is predicted to be as much as 3" in portions of the Mid Atlantic and Northeast by Saturday. Tropical Storm Josephine has been weakened by strong wind shear and dry air. It now has maximum winds of 60 mph and is forecast to weaken further by tomorrow. At this point, Josephine is unlikely to become a hurricane. Hanna has become larger, but not stronger, and is now turning northward at 6 mph. Ike is nearly a hurricane at 70 mph. Josephine is also a little stronger with winds of 65 mph. The triple tropical storms Hanna, Ike, and Josephine continue at much the same strength this morning, although Josephine has intensified a little. Tropical Storm Hanna, with maximum winds of 60 mph, has been moving erratically, but it seems to be completing a tight loop. As the upper level circulation pattern to the north becomes readjusted, Hanna is expected to gradually turn to the northwest with an increase in forward speed and strengthen. On the forecast track, it will pass through the Bahamas and approach the Southeast Coast by Friday. Landfall is possible as a hurricane anywhere from south-central Florida to the Carolinas, but the most likely target at this point is South Carolina. Once inland, a weakening Hanna should bring moderate to heavy rain through the Mid Atlantic area and the Northeast. Tropical Storm Ike has maximum winds of 65 mph and continues moving west northwestward from a position about 835 miles east northeast of the Leeward Islands. Tropical Storm Josephine, which has strengthened a bit to winds of 60 mph, is further east in the Atlantic, about 220 miles west southwest of the Cape Verde Islands. Josephine is also moving west northwest. Aircraft reconnaissance confirmed that Hanna weakened further this afternoon to maximum winds of 65 mph as it meandered slowly southward near the southern Bahamas. Some strengthening along with a turn to a more northwesterly direction are expected. Hanna could become a hurricane again in the next couple of days. The complexity of the upper level circulation pattern around Hanna means that there is greater uncertainty in the intensity forecast than usual. However, Hanna is still expected to reach the Southeast U.S. coast somewhere from central Florida to the Carolinas as a Category 1 hurricane by the weekend. In anticipation of Hanna's arrival, CNN reports that Florida has already declared a state of emergency. Tropical Storm Ike's maximum winds increased to 65 mph as it trucked along in the tradewinds at a brisk 17 mph. It has a good chance of becoming a hurricane within 12 to 24 hours. Tropical Storm Josephine now has winds estimated at up to 50 mph as it moves westward away from the Cape Verde Islands. Josephine has very favorable water temperatures and wind shear conditions, so it is expected to become a hurricane within a couple of days. As Gustav loses its tropical identity, a new storm has formed in the Atlantic, so there are still three active tropical cyclones. The one with the most immediate threat to land is Hanna, which is expected to reach the Southeast U.S. coast and interior Mid Atlantic area after affecting the Bahamas. 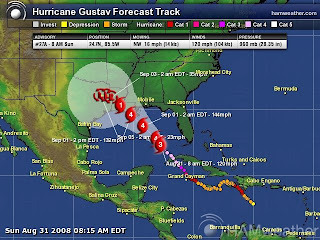 Tropical Storm Gustav weakened to a depression overnight. Tropical advisories are no longer being issued on the storm, but it's still expected to be a prolific rain maker in the interior of the Gulf Coast Region. 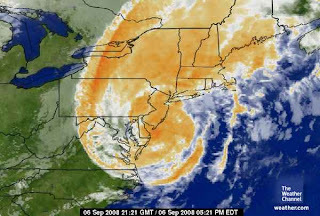 Hurricane Hanna was downgraded to a tropical storm. It's still being bashed by some upper level wind shear aided by the outflow from Gustav. Hanna is still capable of producing heavy rains over the southeastern Bahamas and Hispaniola. Little change is expected in Hanna's 70 mph maximum winds through tonight, but it has a better chance of strengthening tomorrow. Tropical Storm Ike has strengthened a little to maximum winds of 60 mph. It could become a hurricane on Wednesday. Tropical Storm Josephine developed from Tropical Depression 10 this morning near the Cape Verde Islands in the far eastern Atlantic. It has maximum winds of 40 mph, and it has a chance of becoming a hurricane in the next couple of days. 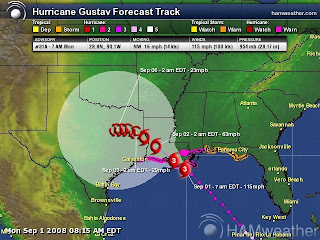 Gustav has weakened to a tropical storm. Maximum winds are down to 60 mph. Hurricane Hanna has been meandering and is expected to move little through Tuesday. Maximum winds are still 80 mph. Tropical Storm Ike remains at 50 mph, continues moving west. 8 pm Update: Hurricane Gustav has continued to weaken today as it moves further inland. At 8 pm, the storm was a minimal Category 1 hurricane with winds of 75 mph. It was located in central Louisiana, moving northwest at 14 mph. Gustav will continue to bring heavy rains to portions of Louisiana, as well as southern and western Mississippi, northeastern Texas, Arkansas, southern Missouri, and southeastern Oklahoma. Isolated amounts up to 20 inches are possible. Hanna has strengthened to a hurricane with maximum winds of 80 mph. It is now nearly stationary near the Caicos Islands. It is expected to gradually begin moving northwestward toward the central Bahamas in the next couple of days, eventually reaching the Southeast Coast. As expected, Tropical Depression 9 became Tropical Storm Ike with maximum winds of 50 mph. It is located well out in the Atlantic, about 1400 miles east of the Leeward Islands. Ike's westerly track is likely to bring the storm near the southern Bahamas as a hurricane by the middle of the weekend. As if that wasn't enough tropical excitement, a tropical wave even further out in the Atlantic, about 200 miles from the Cape Verde Islands, is showing signs of organization. It could pop out as Tropical Depression 10 at any time in the next couple of days. If it develops further, it would be Tropical Storm Josephine. The three levels of tropical cyclone are tropical depression, tropical storm, and hurricane. We now have all three active in the Atlantic basin. As Hurricane Gustav moves inland (scroll down to the previous post for details), Tropical Storm Hanna is looking much better organized this morning, and Tropical Depression 9 has formed about halfway between Africa and the Lesser Antilles. As of 11 am, Tropical Storm Hanna has strengthened to maximum winds of 60 mph. It's moving west southwest around 5 mph towards the southeastern and central Bahamas. The future development of Hanna and its track are tricky. They depend on its interaction with a complex upper level circulation pattern, including the outflow from the weakening Gustav to the west. The current forecast, however, has Hanna strengthening to a hurricane over the Bahamas and threatening the Southeast Coast later in the week. The just-issued initial advisory on Tropical Depression 9 puts its strength at 35 mph, but it is expected to become Tropical Storm Ike later today. The National Hurricane Center forecast takes the storm generally westward toward the Bahamas as a hurricane. 11 am Update: Hurricane Gustav made landfall around 9:30 CDT near Cocodrie, Louisiana, about 70 miles southwest of New Orleans. Maximum winds are still 110 mph, but the storm is expected to weaken further as it moves inland. Although U.S. markets are closed for the Labor Day holiday, oil prices have been dropping sharply in overseas trading. Politicians are struggling with the political ramifications of Gustav in relation to the disrupted opening of the Republican National Convention today. Hurricane Gustav was downgraded to Category 2 this morning as it approached landfall on the Louisiana coast west of New Orleans. Maximum winds are 110 mph, and the storm is continuing to move northwest at 16 miles per hour. 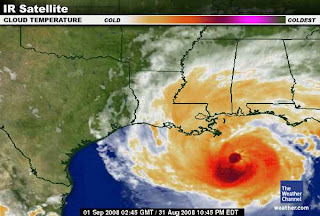 The center of Gustav is located about 80 miles south southwest of New Orleans and about 20 miles from Port Fourchon on the Louisiana coast. On this track, the storm will make landfall within the next 2 hours, or by about 10 am local time. Based on the diminished strength of the storm and its distance west of the city, the New Orleans Times-Picayune reports that "Corps of Engineers chiefs say they anticipate no storm surge flooding due to Hurricane Gustav." Hanna still weak, but bears watching. Late PM Update: Hurricane Gustav is holding its Category 3 strength with 115 mph maximum winds as it approaches the Louisiana coast. Forward speed is slightly lower at 16 mph toward the northwest. At 11 pm, the storm was centered about about 220 miles southeast of New Orleans. 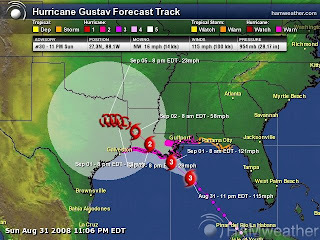 On this track, Gustav will make landfall in the daylight hours Monday morning. The lowest pressure, which had been dropping, has leveled off at 954 mb. Dropsonde observations show that drier air is moving into the center of the storm at middle and upper levels. Therefore, little change in intensity is likely before landfall. 8 pm Update:Tropical storm force winds from Hurricane Gustav are about to reach the coast of southeastern Louisiana, and hurricane force winds will reach the coast after midnight. The maximum strength of Gustav is unchanged, but reconnaissance indicates that the extent of hurricane force winds has expanded, especially in the northwest quadrant. The storm remains on track for landfall on the Louisiana coast on Monday. Some intensification may occur tonight, but that is likely to be limited; satellite imagery indicates that dry air is wrapping into the circulation from the west and south. 5 pm Update: Hurricane Gustav remains a Category 3 storm at 5 pm with maximum winds of 115 mph. Some fluctuation in intensity may occur overnight, but the storm is expected to remain a major hurricane at landfall in Louisiana tomorrow. The storm is located about 215 miles south southeast of the mouth of the Mississippi and is moving northwest at 18 mph. The forecast track has shifted slightly to the west, so the Hurricane Warning has been extended westward along the Louisiana and Texas coasts to east of High Island, Texas. Warnings now extend all the way from the Alabama/Florida border to east of High Island. Ordinarily, a possible hurricane threat to the Southeast coast would get more attention, but Hanna has been overshadowed by big brother Gustav. Plagued by persistent wind shear, Hanna has remained a weak tropical storm. As of 5 pm today, maximum winds were 45 mph. It was moving west at 10 mph from a position about 140 miles east of the Bahamas. Hanna's future is subject to some complicated interactions with the upper level flow pattern, but its prospects are strong enough for it to threaten the Bahamas as a tropical storm and potentially the Southeast U.S. coast as a hurricane later in the week. Hurricane Gustav has maximum winds of 115 mph as of 2 pm, based on aircraft reconnaissance. The storm continues to move northwest at 17 mph from a position about 270 miles southeast of the mouth of the Mississippi. Gustav remains a dangerous Category 3 storm and some re-intensification, possibly to Category 4, is likely before the storm makes landfall as a major hurricane on Monday. Hurricane force winds currently extend up to 50 miles, and tropical storm winds up to 200 miles, from the center. 11 am Update: Hurricane Gustav's maximum winds remain at 120 mph as of 11 am. The storm is moving slightly faster, 17 mph, toward the northwest. Satellite images show a more ragged appearance, consistent with the storm's weakening since yesterday. The circulation is also showing the weakening effects of some wind shear. The wind shear is likely to reduce as the storm moves, but it will also be moving over relatively cooler waters. Therefore, some intensification is forecast, but it is likely to be slow to occur. The latest models are showing a westward shift in the landfall point on the Louisiana coast, but the official forecast is not yet reflecting that shift. 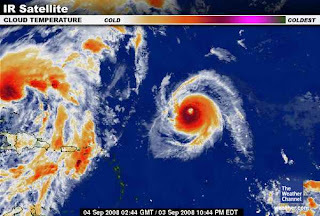 Hurricane Gustav weakened overnight to a Category 3 storm with maximum winds of 120 mph. It's moving northwest from the southeastern Gulf of Mexico at a speed of 16 mph toward a landfall on the northern Gulf Coast on Monday. The most likely target of the center is southeastern to western Louisiana, but strong winds, heavy rain, and an extremely dangerous storm surge are likely some distance to the east of the center. Storm surges could be as much as 18-25 feet above normal tidal levels near and to the east of the center. A Hurricane Warning is in effect from Cameron, Louisiana eastward to the Alabama/Florida border, including New Orleans and Lake Pontchartrain.